Nylon Endless Slings are one of our most popular lifting slings due to their affordability, versatility and strength. Endless slings feature a continuous loop. The design of the continuous loop allows the load contact point to change with each application. Varying the wear points helps extend the life of the sling. 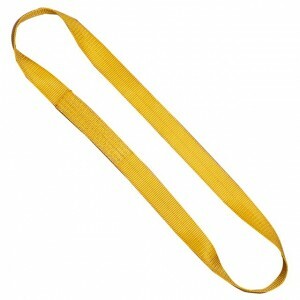 Nylon endless slings are great all-purpose slings and work in choker, vertical and basket hitches. The sling legs can be spaced apart on the load in certain applications allowing for greater stability. CORE™ Nylon Slings are proudly made in the USA. Our nylon endless slings feature treated nylon webbing that offers greater abrasion resistance. Each CORE™ Nylon Endless Sling is fitted with a heat-imprinted tag and meets or exceeds all present OSHA and ASME B30.9 standards. Nylon endless slings are available in polyester and in many different strengths and sizes. Call our lifting experts at 888-794-0587 Monday - Friday, 7am-5pm CDT. You can trust us to design a quality lifting sling that meets your needs. CORE™ Industrial Slings also offers Polyester Endless Round Slings which have similar benefits to the Nylon Endless Slings but have less stretch.